The race for the Moscow Four Star gold is down to two women’s teams: Americans Summer Ross/Sara Hughes, who are in their first year together, and Brazilian power duo Agatha Bednarczuk/Eduarda ‘Duda’ Santos Lisboa, who teamed up in January 2017. Ross/Hughes, the No. 9 seed in the tournament, faced fellow Team USA representatives No. 5 April Ross/Alix Klineman in the quarterfinals to start Saturday’s action, winning 21-18, 21-19. In the semifinals, the duo took down third-seeded Germans Chantal Laboureur/Julia Sude 23-21, 21-14 to earn the shot at gold. No. 2 Agatha/Duda swept past Italy’s No. 23 Marta Menegatti/Viktoria Orsi Toth 24-22, 21-17 in the quarters before dismissing No. 13 Swiss pair Nina Betschart/Tanja Huberli 21-14, 21-9 in the semis. A victory would give Ross/Hughes their first FIVB Tour title and second FIVB medal, following bronze at the Espinho Four Star on July 7. A gold in Moscow would be the fourth for the duo, following titles in Itapema (May 20, 2018) and Rio De Janeiro (May 21, 2017), both four star events. The pair also has runnerup finishes from the World Tour Finals (Aug. 27, 2017) and Fort Lauderdale Major (Feb. 12, 2017). Ross/Hughes will take on Agatha/Duda at 10:05 a.m. ET. Laboureur/Sude will take on Betschart/Huberli for the bronze on Sunday at 8:50 a.m. ET. 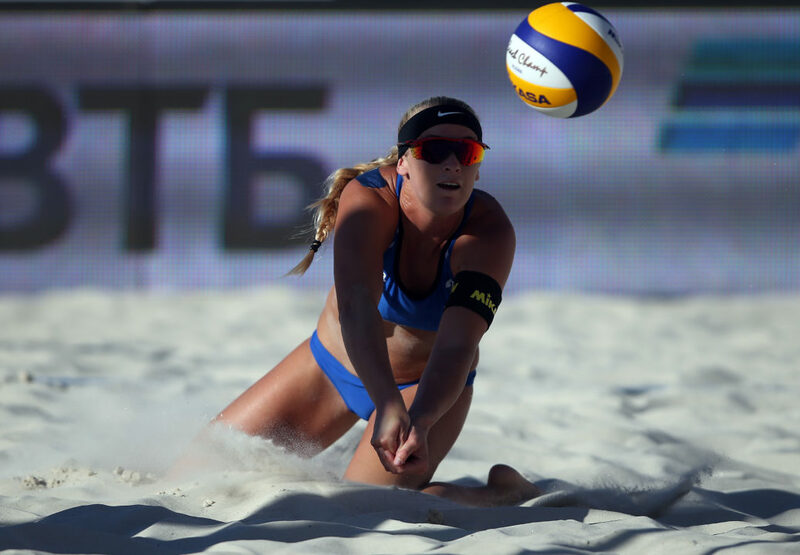 The Germans are looking for their fourth podium finish of the year, following silvers at the Gstaad Major (July 15) and Warsaw Four Star (July 1) and bronze on Huntington Beach (May 6). The Swiss, which were the runners up at the CEV European Championships on July 21, are looking for their first FIVB podium finish since a third-place showing at the Hague Four Star on Jan. 7.